In the last few weeks I received a number of calls from international students studying here Toronto who were in need of advice. Admittedly I have a soft spot for foreign students and I appreciate their struggles. I was one myself a couple of decades back. Given the level of confusion that international students have around taxes and recent announcement by the federal government to double international student body in Canada, I thought it is necessary to post this article. I think majority of the international student body see their education abroad as a privilege and many are financially stretched in chasing their academic goals. For instance, University of Toronto tuition fees for international students are 400% higher than for domestic. Financial strains are only exacerbated by culture shock. Although Toronto is very much a multi-culture city, we still have our own rules of behaviorand view of social roles. Language is another barrier for proper integration into the community and impacts financial affairs negatively. On many occasions international students are self-conscious about their less than perfect English. This causes difficulty in the interview process and many either do not persist to explain full context of their respective situation, or service providers take advantage of the language gap and perform suboptimal service for unaware consumer. In many instances students, due to cultural backgrounds, are also prone to “bargain hunting” where cheap tax preparation fee translates into an equivalent service. In most cases of inherited student files, I find lack of continuity schedules, improper disclosure of carryover amounts, missing moving expenses and other numerous elements that should come up in a thorough interview process. Unfortunately, it is a bit of a perfect storm where cash-strapped students are looking for the least expensive service, and this demand is met by service providers who are interested in quantity not quality. At Equilibrium Financial, students get the same level of attention as any other client. We have special rates for our full-time-student clients and we view this work as an opportunity to contribute back to the community. If you are an international student in Canada, it is important that you understand your entitlements and obligations under Canadian tax system. Under Canadian rules, your entitlements and income tax obligations are based on your residency status in Canada. Nearly all international full-time students satisfy residency requirements and can file taxes. If you are not sure of your residency status in Canada for income tax purposes, complete Form NR74, Determination of Residency Status (Entering Canada), and send it to the International Tax Services Office. It is important to understand for international students that in almost all cases it is to the benefit of the student to file taxes. Most students work part-time jobs, have significant tuition spent, urban housing costs and other factors that in compilation of tax files produce a tax refund, HST rebates, and other potential benefits. It is important to understand that CRA will not issue the refund without the tax filing claiming this refund! CRA only follows up with taxpayers in instances where CRA feels that tax-payer owes money! Not all is bad with CRA, specifically in the last few years agency has been optimizing its website and streamlining access to information: for instance, Students and Income Tax Pamphlet. If you are a student, know that we are interested in setting you up for success and I was in your shoes not so long ago. Do not hesitate to connect with me – help is only a phone call or an email away! Peter G. Miller is a nationally-syndicated columnist, speaker and writer whose work appears in a variety of outlets online and off. He is the author of the Quick & Dirty financial eBooks (SilverSpringPress.com) and operates the consumer real estate site,OurBroker.com. More than 250,000 Miller books are in print. If you're tired of mortgages, banks and fees then you might want to consider a new financial product, something called Bitcoin. A least that's been the pitch from a number of backers, people who would prefer to see money as a form of secure digital currency outside the orb of traditional banking, a form of finance that can be used worldwide without steep transfer fees. Indeed, this year one Manhattan-based real estate firm, Bond New York, said it would accept Bitcoins for real estate transactions. It's not an unattractive idea for many households and the concept was gaining some acceptance until the past few days when it was discovered that a Tokyo-based Bitcoin exchange, a company named Mt. Gox, had lost artificial currency worth perhaps $450 million or more. We don't know the exact loss at this writing, but then we don't know whether the missing Bitcoins were lost or stolen. Indeed, it's not clear what you could do with an errant Bitcoin if was stolen given that it's merely a bunch of representational numbers. To understand what's going on here -- and to figure how Bitcoins might play a role with mortgages and real estate -- we need to talk about currency. Back in the good old days, when folks lived in caves, you can pretty much imagine that barter was the exchange system of the time and that it was easy to trade pelts for arrows or corn for meat. Barter worked fairly well on a local basis but the concept did not hold up as people began to travel and trade over long distances. Eventually metal coins came into use, coins which had an agreed value, say three Katanga crosses for a sheep. Coins worked fairly well because there was an accepted value for metal and coins could be weighed, but then came paper currency and a new idea was needed, that a piece of paper had a given value because everyone agreed that it did. In the current era, we believe that a dollar is worth a dollar because it's backed by the "full faith and credit" of the United States government. We also believe that a lot of other currencies have different values: for instance, a dinner in Bucharest that cost 500,000 old lei (pronounced "lew") including salad, bear, and dessert -- about $13.50. And the bear was excellent. The catch is that a lot of people like money but they don't like currency. In some cases they're not too sure about the "full faith and credit" thing, while many people simply dislike all the fees and charges required to get at their own cash. There has to be an alternative and surely in the electronic era we can come up with something outside the usual banking system. Enter Bitcoin. "Bitcoin is a consensus network that enables a new payment system and a completely digital money," says Bitcoin.org. "It is the first decentralized peer-to-peer payment network that is powered by its users with no central authority or middlemen. From a user perspective, Bitcoin is pretty much like cash for the Internet." Bitcoins, it can be argued, are not really too different from online bill paying. If you want to buy a book, shirt or hard drive you enter account information, and shortly thereafter your purchase arrives. No less important, backers suggest that Bitcoins come without the fees and charges that we pay for using ATMs, credit cards and checks. In this sense -- if true -- Bitcoins are a threat to the traditional banking system. Mobile payments are made easy – no sign up, swiping or PIN needed. Security -- Transactions are secured by military-grade cryptography. Nobody, it is thought, can charge anyone or make a payment on others’ behalf. Clients who work with Bond New York may actually be prime Bitcoin users in the sense that Manhattan draws a large number of real estate buyers from across the world, people who might benefit from a common alternative currency. In the same way that a dollar is worth a dollar because everyone thinks it is, the value of a Bitcoin is determined by public acceptance. Bitcoins can be moved worldwide at electronic speed without public knowledge, regulation or fees -- or at least that's the theory. Whether one day it will be revealed that the National Security Agency has tapped into the system is unknown and, for the moment at least, unknowable. As to that military-grade cryptography, the jury is out on that one until the Mt. Gox situation can be better understood. But -- and here's the chilly part -- in the same way that the market value of a dollar or an old lei can go up or down, the same is also true with Bitcoins. At this writing, for example, the value of a Mt. Gox Bitcoin has fallen more than 60 percent. "The Department of Justice recognizes that many virtual currency systems offer legitimate financial services and have the potential to promote more efficient global commerce," said Acting Assistant Attorney General Mythili Raman in testimony last year before the Senate Committee on Homeland Security and Governmental Affairs. However, she added that "the Department has two primary law enforcement interests in virtual currency: (1) deterring and prosecuting criminals using virtual currency systems to move or hide money that is used to facilitate, or is derived from, criminal or terrorist acts, i.e., money laundering; and (2) investigating and prosecuting those virtual currency services that themselves violate laws aimed at illegal money transmission and money laundering." Bitcoin was developed in 2009 and five years later has become the subject of widespread interest and speculation. Is artificial currency for real? Is Bitcoin the alternative currency of the future? At this point we simply don't know, but the experiment is sure to continue, whether through Bitcoin or another form of electronic currency. Meanwhile, what would you trade for a Katanga cross? Why big tax refunds are not helpful, and what to do if you are expecting one. Many people are outright exuberant when they find out that they are due to get a big refund from CRA or IRS. And, this is not to mention the profound disappointment experienced when some individuals find out that they have taxes owed and have to process a payment. What could be wrong about getting, for example, a $5,000 direct deposit into your account? Given that Canadians are already subject to very high taxation rates and our friends south of the border continuing to struggle with sluggish economy, to receive a substantial refund from the government treasury would put a smile on many faces. Now, let us take a closer look and see if there indeed a cause for celebration or an opportunity to reexamine our attitudes about refunds. Consumer behavior studies illustrate an interesting trend where people spend money very differently depending on how it is acquired. Those individuals that earned their wages regardless of the kind of labour, consistently show similar spending patterns. To contrast, those that come to sudden injections of cash, like lottery winnings, tax refunds, and other 'surprise' money, spend it twice as fast as earned money. Specifically when it comes to tax refunds, it is unfortunate to observe that some of us adopt this celebratory attitude toward tax refunds because it is too a product of your hard work and requires every bit of care as the rest of your earnings. What makes up your tax refund? Simply put, it is an excess of taxes you had paid throughout the year. This is important because this also means that your money was held during the course of the year without compensation for loss of its purchasing power. We know from TVM (Time Value of Money) principle that money today has a different purchasing power (value) than the same amount of money tomorrow. To illustrate the point think of how much more you have to pay today for a can of soda in comparison to 20 years ago. And, an even better current example on fuel prices - take a look at this chart from GasBuddy.com that showcases Canadian gas price 1-month inflation. This means by over-taxing you and holding on to your earned dollars, you were denied opportunity to use money at its maximum purchasing capacity, and to make things worse, you are also not reimbursed for loss of purchasing power. To quantify your loss, consider that the average inflation rate in Canada during 2011-2013 is 1.79% with 2011 rate alone at 2.91% (source: www.inflation.eu). This means that on average in addition to your $5000 tax refund you are at a minimum to receive $89.5 in lieu of average inflation, and in 2011 this would be $145.5. Above figures do not take into account that your refund would have been available to you throughout the year and you would have had an opportunity to have incremental benefit of investments that could easily exceed inflation rates. Consider the following you are no longer over-taxed and earlier mentioned refund of $5000 is paid out to you on a monthly basis, this translates into additional $416.6 per month. Given these additional funds you decide to invest and choose a fund yielding 10% annually. This will translate into $5234.8 by the end of 12 months. - Invest in tax-free-savings account in lieu of emergency (rainy day) fund. When a group of 86 large U.S. companies came out in late October in favor of fixing the debt it was seen as a rare example of corporate unity, and a wake up call on just how urgent an issue the growing federal deficit has become for business. In a new report, the Institute for Policy Studies (IPS), a liberal Washington think tank, argues that the group, called “Fix the Debt” is basically a larger version of an earlier Washington corporate lobbying group called “Win America”, and shares its focus on getting corporate money now being held overseas back into the United States with little or no taxes taken out. Win America was pushing mainly for a lower tax rate on the repatriation of foreign earnings, but Fix the Debt is instead pushing for a shift by the United States to a territorial tax model. Under this kind of system, the companies would paylittle or no taxes on foreign earnings when those profits are brought into the to US. It’s especially beneficial to companies that earn a significant amount of profit in offshore tax havens. Such a change would result in a $134 billion windfall for the 63 publicly traded companies in the Fix the Debt coalition, IPS calculates. Requests for comment sent to Fix the Debt were not replied to. The Milan court sentenced him to four years but later cut it to one year because of an amnesty law. Mr Berlusconi condemned the sentence as "intolerable judicial harassment". He will remain free pending appeals.He and others were accused of buying US film rights at inflated prices via two offshore companies under his control. It is the first time Mr Berlusconi - who has faced a number of trials - has been convicted of any crime concerning his business activities. He has in the past either been cleared, or cases have run beyond the judicial time limit. In 1997 he received a suspended sentence for false book-keeping but that conviction was reversed on appeal. In the case for which he was sentenced on Friday, prosecutors argued that part of the money declared for the purchase of film rights was skimmed off to create illegal slush funds, reducing tax liabilities for Mr Berlusconi's Mediaset group. The court handed Mr Berlusconi a longer sentence than the three years and eight months requested by prosecutors. However, it later announced that the sentence would be cut to one year due to a 2006 amnesty law aimed at reducing prison overcrowding. It ordered him and his co-defendants to pay 10m euros (£8m) in damages and banned him from holding public office for three years. 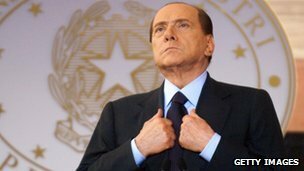 "It is a political, incredible and intolerable judgement," Mr Berlusconi said on Italia 1 - one of the TV stations he owns. "It is without any doubt a political verdict just as all the cases invented against me are political." In all, 11 people were on trial. Three were acquitted including Mediaset chairman Fedele Confalonieri, a close associate of Mr Berlusconi, and four were cleared because the statute of limitations had run out. The three others convicted alongside the former prime minister included Hollywood producer Frank Agrama, who received a three-year sentence. The trial began six years ago and has been subject to repeated delays, in part because of an immunity law that protected Mr Berlusconi while he was prime minister. Silvio Berlusconi is down but not out as a result of his conviction and sentencing for tax fraud. But the verdict had an immediate effect on his personal fortunes. Shares in his flagship Mediaset TV company slumped by 3% on the Milan stockmarket. Mr Berlusconi's active political career can however be considered terminated by the successful conviction. He had already announced earlier in the week that he was stepping down as leader of his Freedom Party and will not be offering himself for re-election as prime minister in next year's general election. The Italian media mogul has spent the greater part of the past two decades drawing up legislation designed to ensure his impunity in various current criminal cases in which he has been charged with crimes of corruption. It is ironic that the reduction in his sentence from four years to one year is due to an amnesty decision by a rival centre-left government in 2006, aimed at reducing Italy's prison population. The truth is, wearing a disguise can be embarrassing at times. It’s no different in tax planning. Some who are considered to be officers or employees have tried to put on a disguise to gain tax breaks that they aren’t normally entitled to claim. Most commonly, these folks “dress up” as corporations and argue they are carrying on a business. A recent court decision is a reminder that the taxman doesn’t have a sense of humour when it comes to disguises. This is a story about Larry Gitman and his three sisters, who inherited assets from their mother in 2002. She left them with 13 rental properties, cash and a fur business. Now, Mr. Gitman owned a company, 9098-9005 Quebec Inc. (Q Inc.), which provided services to the De Facto Partnership. Specifically, these services consisted of managing the real estate assets, managing and developing the fur business and finding new business opportunities to invest in. The services provided by Q Inc. to the De Facto Partnership essentially were provided by Mr. Gitman – the sole shareholder of Q Inc. Mr. Gitman’s sisters were not involved in the management or development of the real estate or other businesses. Q Inc. charged an annual fee of $150,000 for the services it provided. Given that Q Inc. filed its tax returns as a small business corporation, the company claimed the small business deduction, which reduced the overall tax paid by the company. Here’s the issue: The Canada Revenue Agency (CRA) came to the conclusion that Q Inc. should not be entitled to claim the small business deduction. Why not? The CRA determined that, although Mr. Gitman billed for his services through Q Inc., he was really an officer of De Facto Partnership (and his mother’s estate prior to the transfer of assets to Mr. Gitman and his sisters), and therefore should face tax as though he personally earned the fees as an officer. Our tax law is designed to prevent employees, or officers (as in Mr. Gitman’s case), from setting up a corporation and earning their income from employment or their office through the corporation, taking advantage of corporate tax breaks, such as the small business deduction. A corporation used in this manner will be considered a “personal services business” (PSB). A PSB is a business, carried on by a corporation (Q Inc. in the case above), where it’s reasonable to conclude that, if not for the existence of the corporation, the individual providing the services (Mr. Gitman) would be regarded as an officer or employee of the entity receiving the services (the De Facto Partnership). There’s an exception to being considered a PSB if you employ more than five full-time employees. Where a corporation is carrying on as a PSB, it will face tax at the full corporate tax rate and there will be a limit to the types of deductions that can be claimed by the corporation. Specifically, it can deduct salaries, wages or other remuneration paid to the “incorporated employee or officer,” the cost of providing benefits or allowances to that individual, legal fees to collect amounts owing, and a few other costs that would have been deductible by the employee or officer directly. If you’re concerned that you might be considered an employee and face the PSB rules, read through CRA publication RC4110 (available at cra.gc.ca) for some guidance on employment versus self-employed status. Avoid those factors that point to employment status. Finally, if you have depreciable assets, such as a car or computer, you won’t be able to claim capital cost allowance (depreciation) in a PSB, but you could still face a taxable benefit for using the asset personally, so it may be better to own those assets personally instead. Has China’s economy bottomed out? Economists and analysts are posing that question following the Oct. 18 announcement that gross domestic product grew 7.4 percent in the third quarter, from a year earlier, down from 7.6 percent growth in the previous three months. China’s economic growth has started to stabilize, Premier Wen Jiabao said in a recent meeting with heads of Chinese companies, industrial leaders, and local government officials, the Xinhua News Agency reported on Oct. 17. The economy will continue to show “positive changes,” Wen said. He has set a target of 7.5 percent growth for the year. With continued weakness in Europe and North America, “what we see is a good performance. It augurs well for continued soft landing,” John Quelch, professor of international management and dean of China Europe International Business School in Shanghai, said in a telephone interview after China’s statistics bureau released the latest growth figure. Contributing to the optimistic sentiment: a slew of positive indicators throughout the economy, suggesting a corner may have been turned, following seven quarters of slowing growth. Industrial production, for example, grew 9.4 percent; fixed asset investment in cities grew 20.5 percent; and retails sales were up 14.2 percent—all ahead of estimates. Exports and money supply also grew faster than expected. “In our view the September data suggest that a bottoming out may be in sight,” Louis Kuijs, chief China economist at Royal Bank of Scotland in Hong Kong, wrote in an Oct. 18 note. The good news has lessened pressure on Beijing to take further loosening measures, even as it prepares for a once-in-a-decade leadership transition, beginning at a Party Congress opening on Nov. 8. China’s central bank has left interest rates alone since July, following two cuts to the benchmark rate in one month. That followed three cuts in bank reserve ratio requirements, starting last November. But even as these latest numbers have raised hopes, there are still worrying signs in the Chinese economy, particularly in such industries as steel, cement, and autos, now facing overcapacity following several years of hyper-charged investment growth. “Investment outside of real estate and infrastructure—mainstream corporate investment—appears to be losing speed, weighed down by spare capacity and weak profits,” says RBS’s Kuijs. A new study published by the Social Science Research journal reveals that second-generation Chinese and South Asian immigrants in the US, Canada, and Australia are more successful than the respective mainstream populations (third- and higher-generation whites). Jeffrey G. Reitz and Naoko Hawkins from the University of Toronto and Heather Zhang from McGill University examined survey and census data from these countries to compare the achievements of immigrants and their offspring. Data showed that immigrants in the US, Canada, and Australia have varied degrees of success due to each country’s different educational and labour market institutions. For instance, in the US, Chinese immigrants often have fewer years of education than the mainstream population; in Australia, they have more. However, Reitz, Hawkins, and Zhang also discovered that these cross-national differences in immigrant success are largely eliminated for the second generation, many of whom outperform the mainstream population. For example, in all three countries, second-generation Whites, Afro-Caribbeans, Chinese, South Asians, and other Asians all have, on average, more education than higher-generation Whites of the same age. The Chinese second generation in particular is much more educated. In the US, this group’s average number of years of education is about 15% above that of the mainstream population. In Canada this average is 20% higher than the mainstream’s; in Australia it is 17% higher. Additionally, in all three countries, the second generation from almost all ethnic immigrant groups obtains more managerial and professional jobs than does the mainstream population. Reflective of their higher education, second-generation Chinese and South Asians are notably more successful in occupational attainment. In all three countries the number of second-generation Chinese and South Asians who work in managerial and professional occupations is nearly double that of the mainstream population of the same age. Results for second-generation Afro-Caribbean blacks in the US and Canada showed that they have, on average, the same amount of education as their respective mainstream populations, but are not as successful in obtaining skilled occupations. Nevertheless, their group achieves remarkable upward mobility from the first generation to the second, especially in the US. These findings bring about the question as to why inheritance of social class does not apply to immigrants in these countries in the same way that it does to the mainstream population. The answer may lie in the immigrant parents’ high education levels: despite the economic hardship they experience, many immigrants impart the value of education to their children, which in turn helps ensure their employment success. In addition, the children, born and raised in their host society, have fewer employment difficulties than their parents did. Source: A summary of the research can be found at http://sociology.uwo.ca/cluster/en/ResearchBrief9.html. CALGARY - A tax policy expert calls Alberta's oilsands royalty regime the "poster child" for how governments ought to collect their due from the energy industry. Jack Mintz, at the University of Calgary's School of Public Policy, says royalties should be based on companies' bottom lines — a so-called "rent-based system" that takes into account costs such as labour. That's the way it works for oilsands producers in Alberta and in places like Australia, Norway and the United Kingdom. But conventional producers in the province — as well as those in Saskatchewan, British Columbia and much of the United States — have their royalties calculated based on their top-line revenues. Mintz says the revenue-based systems can get really complicated and could discourage investment. In a report, Mintz looked at the energy royalty regimes of Brazil, Canada, Norway, the U.K., the U.S. as well as five provinces and four U.S. States.